Last year, we were Asian Private Banker’s Most Promising Fintech Startup. This year, we've been awarded the prestigious title of Best Growth Strategy by Asian Private Banker's Technology Awards 2018. Bondlinc has indeed grown and expanded into Hong Kong, where there is a growing demand for technology to meet the banks’ regulatory requirements. We are truly thankful for the recognition of our hard work and vision to standardize and automate bond trading processes. This is another milestone for us as we strive to spread our solutions throughout the private banking industry. Congratulations to all the other winners! Thank you for all the belief and support you have invested in Bondlinc. 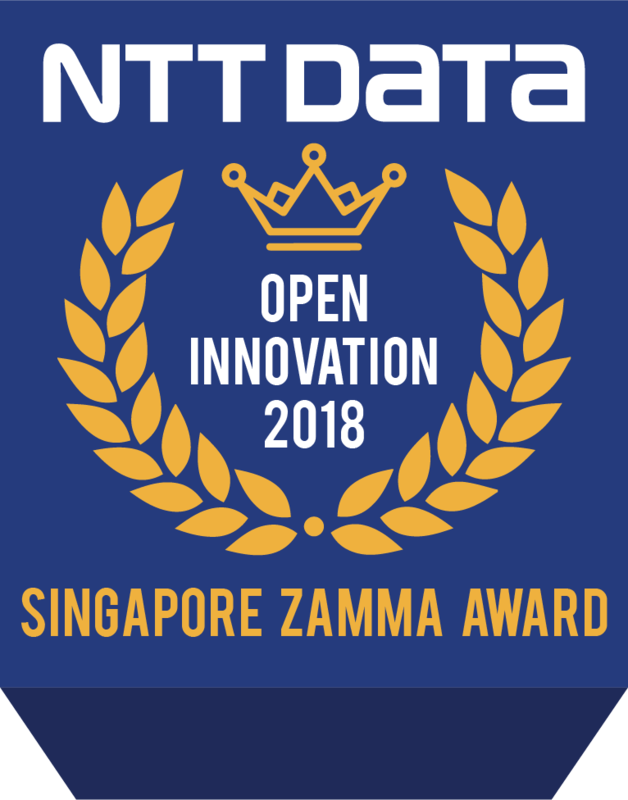 We started the year 2018 with a couple of awards: the Zamma Award at NTT Data’s Open Innovation Contest as well as Asian Private Banker’s Most Promising Fintech Startup Award. In July, we opened Bondlinc Hong Kong to spearhead sales of our RegTech solutions, with Fixed Income expert Dr. Edward Chan. At the Singapore Fintech Festival 2018, we were recognized as one of the finalists for the Fintech Awards. To wrap up a fantastic year, we signed BNP Paribas Wealth Management as our 4th client since our inception in early 2017. As we look back upon the past year, we would like to thank all those who have helped us shape our business. Thank you all again for a great 2018, and we wish everyone a Happy New Year! Looking forward to an exciting 2019! BNP Paribas Wealth Management (WM) has onboarded a new fintech firm to fulfil its bond trading needs, Lemuel Lee, Asia deputy head of investment services told Asian Private Banker. The French lender is working with Bondlinc — a trading automation platform that aims to digitalise private banks’ and securities houses’ access to bond market intel — to automate the process of creating updated fixed income prospectuses in a bid to comply with regional regulations. Ong Eng Keong, Bondlinc’s CEO, said the firm is “excited” to work with BNP Paribas WM “to improve, automate, and standardise the existing client bondselling processes”. The parties are currently finalising the integration and aim to roll out the solution across BNP Paribas WM’s Asia offices before the close of 2018. According to Lee, BNP Paribas WM welcomes working with fintechs as they allow the bank to better allocate its resources and shift away from “inefficient manual labour” and invest more in “adding value such as advisory and services”. “Regulations and technology are constantly evolving; we need to keep abreast of the changing technology in the market and stay ahead of the competition,” he said, adding that the wealth manager constantly assesses its capabilities, considers what it can build, and scans the market for new developments. “If a solution in the market is more mature and makes sense as a complement to our platform, and we believe we do not have the expertise to build it in-house, then we work with fintech providers,” he explained. Currently, Lee said, projects with “a couple more external vendors across multiple fronts, spanning from research to execution” are underway. Earlier this year, BNP Paribas unveiled new digital tools which were developed at what it calls its ‘factories’, located in Singapore, Geneva, and Luxembourg. At the time, Pierre Vrielinck, head of global Asian markets at BNP Paribas WM, said partnering with fintechs is “essential”. 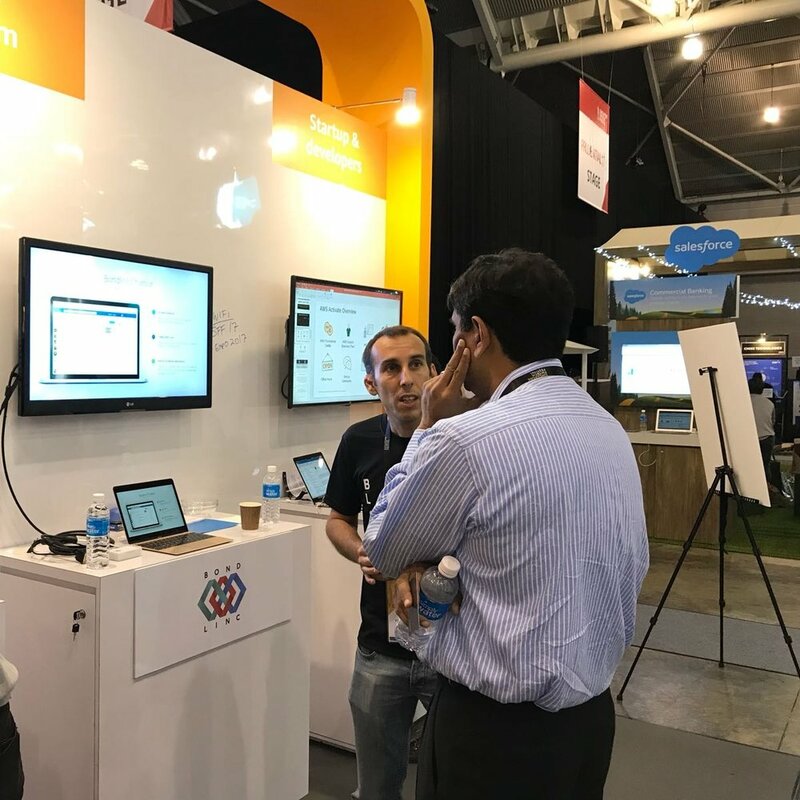 We are very proud to conclude our second Exhibition at the Singapore FinTech Festival 2018 on a high note! In three days, we have met many people who were very keen to join our quest to automate, standardise, and revolutionize the fixed income landscape. 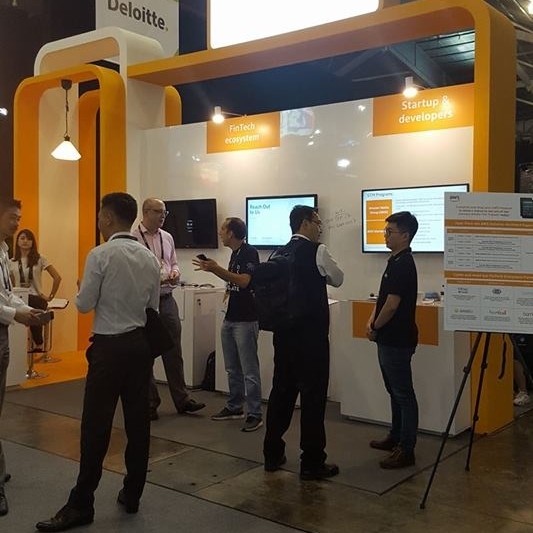 Despite our niche focus in the bond market, we were pleasantly surprised that the festival drew many interested and relevant contacts to our booth at the Asean Zone, Startup Kiosks. We have been delighted to share our trading module, our prospectus catalogue service (PCS), as well as our chat solutions to numerous financial institutions, asset management companies, and potential investors. In addition, many partnerships with data providers, market news providers, and blockchain collaborations were explored for further discussions in the near future. We are excited to share our solutions and work towards a more connected and transparent bond market! Another highlight was being nominated as one of the top 10 finalists by MAS and ABS for the Fintech Awards (Singapore Founder). Although we did not win, we were still honoured to be among these notable FinTech companies. A big congragulations to all the winners! Thank you for taking the time to come by our booth to know more about Bondlinc and our bond trading solutions. We look forward to following up on all the contacts we have gained during these three fruitful days! See you next year at Singapore FinTech Festival 2019! 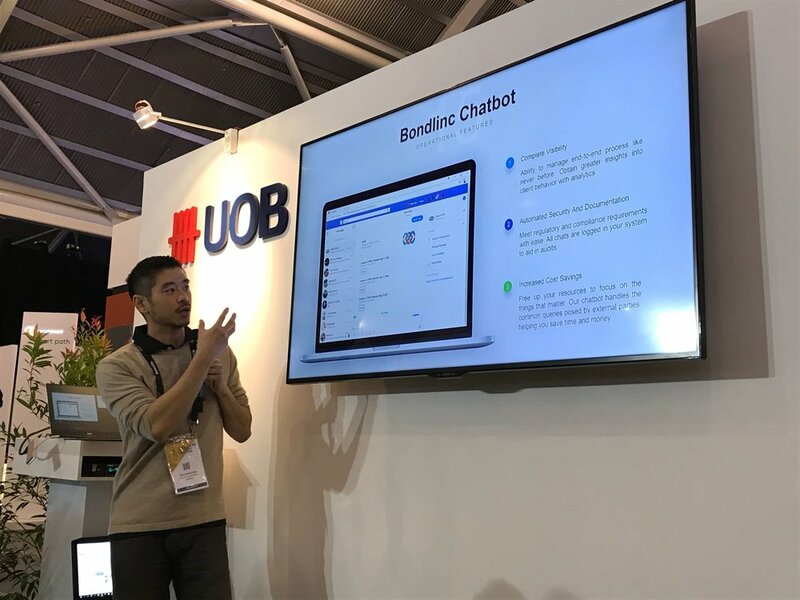 Exciting times as the Bondlinc Team pitches our automation products to various banks in Hong Kong! Jumping on many leads established by the Hong Kong sales team, this week’s fruitful joint-effort has led to many promising engagements. We are honored to be picked as one of the Top 40 Finalists for the upcoming FinTech Awards 2018 for our innovative bond trading solutions! Bondlinc’s Product Repository System (PRS) is one of the modular solutions that help financial institutions automate and digitalize the bond trading workflow. Financial regulators mandate that sufficient sales documents are to be provided to Accredited / Professional Investor clients of Private Banks before a trade can be recommended and a bond instrument can be traded. Bondlinc's PRS provides and automatically manages a centralised database of prospectuses and offering documents for bonds in the primary and secondary market. In general, PRS provides easy access to bond prospectuses and where available, other documents including but not limited to term sheets, pricing sheets in the form of unique distributable hyperlinks for our clients to distribute to their customers. PRS is modular and has the ability to integrate into existing banking infrastructure for delivery through other front-end mediums of our client's choice. The system also automatically extracts information from emails or PDF attachments within them, by leveraging on multiple proprietary technologies - it creates a bond record, flags out relevant special/risk features from the prospectuses, and generates customised bond factsheets. It notifies the Financial Institution through social messaging applications, SMS, email, or BondChat when a deal is ready for distribution to their customers - leveraging on analytics to provide greater granularity over traditional distribution methods. Bondlinc, a Financial Technology (Fintech) software-as-a-service company, has recently inked a major contract with Horangi Cyber Security. The agreement covers Bondlinc's subscription to a comprehensive suite of Horangi's cyber security products and services, which would serve to boost its digital security against evolving threat vectors in the world. In a recent annual cybersecurity report, Horangi has discussed extensively on the latest cybersecurity threats and why Small-Medium Businesses (SMBs) were particularly susceptible to cyber attacks. Horangi has continued to focus on serving SMBs and the middle-market. Horangi believes that cybersecurity solutions can remedy the lack of cybersecurity professionals in the industry. Bondlinc's new investment into cybersecurity solutions comes as it seeks to expand to overseas markets with its revolutionary bond trading product. By subscribing to Horangi's comprehensive suite of cybersecurity solutions, Bondlinc takes the lead in the SMB sphere on investing in cybersecurity. Recently, Bondlinc officially onboarded its first global client, testifying Bondlinc’s establishment in the Fintech arena as a trusted solutions provider. If you are interested in Cybersecurity solutions, speak to Horangi's consultants today! Continue watching this space for more Bondlinc updates! There is plenty of talk about how fintech (financial technology) could disrupt the industry by employing technology and innovation like roboadvisory software in areas where traditional methods have held sway. However, there are many exciting new startups that have been set up to complement mainstream banking infrastructures, and not compete with institutional stalwarts. We speak to former bond trader Eng Keong (EK) Ong, the founder of one such startup—bond trading platform Bondlinc—to understand how fintech products are boosting banking systems instead of threatening to replace banks or their staff. How big is fintech’s impact on the local banking sector? EK: Initially, fintech startups were more aggressive and positioned themselves to be competitors of banks. Then, banks aggressively began hiring and building a costly in-house system to fight back. However, the banks now realise they cannot innovate as fast as smaller and more nimble companies. So, the current lot of fintech firms are often helmed by ex-banking personnel who have come out to fix micro issues which they encountered when they were working in banks. The biggest growth areas are where fintech companies can provide solutions to internal processes that are time-consuming, repetitive and manpower-intensive. For example, streamlining the initial interaction with the customer (known as “onboarding”), standardising payments protocols, and aiding in time-consuming compliance protocols. What are the advantages of embracing fintech? EK: Fintech firms are almost always nimbler than the finance industry as they focus on a specific area of improvement, and there are a lot of areas which need improvement. Banks are not able to fix all the problems they encounter, simply because banks are meant to provide banking services, not IT services. Fintech firms constantly look at the problems they are fixing, and keep them fixed—something which the banks will not be able to do. EK: Being highly regulated entities, banks have a large responsibility to keep their clients’ personal information and well-being safe. That is probably their single biggest concern apart from providing consistent daily banking services. By working with fintech, they have to ensure that the companies they work with do not threaten or breach these concerns. Working with banks tends to be a slow and protracted process due to the many layers of approval required for every part of a project to be accepted and approved by all the relevant stakeholders. Is fintech to be feared? Do you believe it could replace banks, human analysts and other current manpower in the finance industry? EK: Realistically, fintech will never replace banks completely. It can play a big role in making banks a lot more efficient. That said, fintech will definitely replace a lot of the menial tasks which are currently done by humans, in the same way new technology changes every other industry when it is introduced. Fintech aims to improve existing processes and by doing so, frees up time for people to do more value-added jobs. Take the humble office printer—if there were no printer technology, humans would have to type everything out? The key is to identify what and where most of the pain points come from and allow fintech solutions to complement existing processes. You’ve mentioned that Bondlinc’s platform was established with the intention to help bond traders, not replace them. How did the business idea come about? EK: My business partner, Daniel Yu, and I are both bond practitioners. We realised that bond trading, although being the largest tradeable asset class in the world, has not evolved in the past 30 years and still could not be traded electronically online, unlike foreign exchange and equity. So, along with my other co-founder, Vincent Caldeira, we looked at creating a solution that could be adopted across the different banks. What are some challenges you’ve faced so far as a fintech company? EK: We are predominantly a B2B business, and dealing with institutions is often slow, requiring layers of understanding by different stakeholders, agreements and negotiations. On the tech side, we have to be compliant in working with banks; and bringing a new technology into a bank is a tedious process as we have to explain at length our business and tech stack to the different IT teams. As we are somewhat disruptive, senior management and people on the ground who would be affected have been a little sceptical about our product. "Cause or Cost for concern? If you're in or working with fintech or financial institutions, and you don't quite know yet know why the new Monetary Authority Of Singapore TRM guidelines matters: this is for you. We've gathered the experts from Horangi, OC Queen Street, PayPal and Bondlinc to share more about how in the world this impacts you AND your customers. The Monetary Authority of Singapore (MAS) has indicated in a recent speech that changes to the Technology Risk Management (TRM) Guidelines are underway. What is the likely impact of these changes, and how can mid-size financial institutions and Fintech companies prepare themselves? Join us in this insightful discussion where leaders in mid-size Fintech & Financial Institutions share their challenges & strategies whilst leading cybersecurity and legal experts share their advice." Held at ICE71 on the 19th of July, 4pm-6pm, the panel discussion will cover the changes, challenges, and solution with regards MAS Technology Risk Management (TRM). Our CTO Vincent Caldeira will be among the expert panelists leading the discussion. Recently the Securities and Future Commission (SFC) in Hong Kong issued a circular to Financial Intermediaries (FIs) regarding the key controls and procedures expected to be in place when using Instant Messaging (IM) applications to receive client orders. This is not a new business practice, but I believe the wide discrepancy on how these risks are being assessed and addressed has called for some level of standardization across the financial markets. While using IM applications introduce several challenges in terms of specific technology, information security, and operational and regulatory risks, such tools are still being widely used by clients and FIs to communicate. This is because they provide a direct channel to distribute relevant and actionable information on a timely basis, while allowing to introduce process efficiency in the interaction between customers and the bankers. As such, we at Bondlinc have enabled IM channels as an inherent part of our solution. Our platform integrates natively with the FIs' clients’ chosen channels (such as Facebook Messenger or WeChat) while providing all the appropriate controls that would be expected of a secure and compliant banking solution. This article describes some of the key measures and controls implemented in the solution to meet the requirements described in the SFC Circular. · The solution provides one central point of interaction for the bank’s employees (Relationship Manager, Dealer) to interact with customers using multiple IM applications. Our solution achieves this with Identity Brokering and User Federation components implemented using some of the most popular security standards for Web single sign-on (SSO) such as SAML 2.0, OpenID Connect and OAuth 2.0. This enables integration with 3rd-party Identity Providers from the FIs as well as leading IM solutions as identity sources. · All order records and contextual information for the order (chat between the institution and its clients) are transmitted and stored for future reference using industry-accepted cryptography standards, in a form that cannot be altered or tampered with. · Data retention for all order management data can be specified and managed according to the FI’s internal policies and regulatory requirements. · The solution manages step-up authentication with an ability to use zero, one or two-factor authentication where appropriate. For example, public information such as details about a new bond issue can be viewed by a customer, without requiring an additional mobile application download or client login. However, access to indicative quotes would require a simple, one-factor authentication. Furthermore, any transaction confirmation will require step up to a second factor of authentication to complete the final transaction. This allows validating the identity of the client at the appropriate time along the transaction process and getting an authenticated digital acknowledgement for audit trail purposes. · Transport security (SSL) is used to protect the communication channel between the IM application and Bondlinc services. This ensures that the end-to-end transmission of order messages is safe. · Message-level security is used to ensure confidentiality by digitally encrypting the message itself, authenticating the originating entity using X509 certificates, and enforcing integrity by using digital signatures. · All messages and order information are securely routed to our central event management pipeline. This allows Compliance to perform real-time monitoring against a set of pre-configured rules (including unusual trading patterns, specific restricted keywords used in conversations with the Relationship Manager or Dealer, etc…), and securely store the information in a data warehouse for reporting, reviewing and auditing purposes. · A specific module for Compliance officers allows reviewing of all historical order conversations and messages. To support any required investigations, dynamic search criteria can be used to search through a specific period of time or particular clients’ accounts. Bondlinc’s solution natively provides critical controls for our customers to efficiently manage the specific technology, information security, operational and regulatory risks that trading bonds over IM channels entail. For more information or for a demonstration, do not hesitate to contact me at vc@bondlinc.com. As the CTO Bondlinc, Vincent oversees the technology design and development of the company’s Software-As-A-Service bond trading platform. The comprehensive solution aims to standardise, improve and automate the traditional bond trading workflow. CEO Ong Eng Keong and CTO Vincent Caldeira receiving the Most Promising Fintech Startup award at the Asian Private Banker Technology Awards Luncheon! We are honoured to be among some well-known and established technology companies receiving one of APB Technology Awards 2017. This is a good way to start 2018, a year in which we are targeting to work closely with Private Banking customers to implement our solution. Bondlinc's mantle is quickly filling up with all these awards! Many thanks to Asian Private Banker for recognizing our hard work! And also a big thanks to our wonderful in-house development team who have been working tirelessly to improve and develop an even better Bondlinc solution! Kotaro Zamma, Head of Section and Kaz Okada, Senior Expert for the Open Innovation and Business Incubation for NTT DATA Corp.
"The global community is facing a variety of challenges, including poverty, hunger, health, hygiene, education, gender and national inequality, energy, climate change, destruction of nature, and peacekeeping. In order to solve these challenges, open innovation will play greater roles than ever so that people throughout the world can work together across national borders in advanced technology and new business models to create solutions. NTT DATA originally started as a public corporation to play a role in the Japanese communication infrastructure. Since the transformation to a private corporation, we have played an essential role in the Information and communication technology (ICT) social infrastructure as the leading system integrator in Japan. Currently, we promote ICT business in over 50 countries across the world." 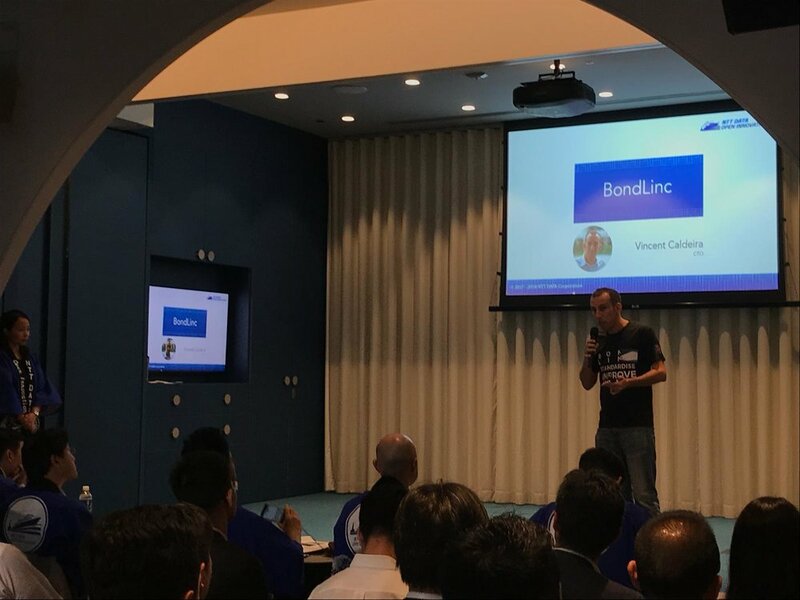 After being invited to participate in NTT's Open Innovation Contest 7.0, Bondlinc submitted a comprehensive business proposal which was subsequently chosen as one of the ten Finalists. 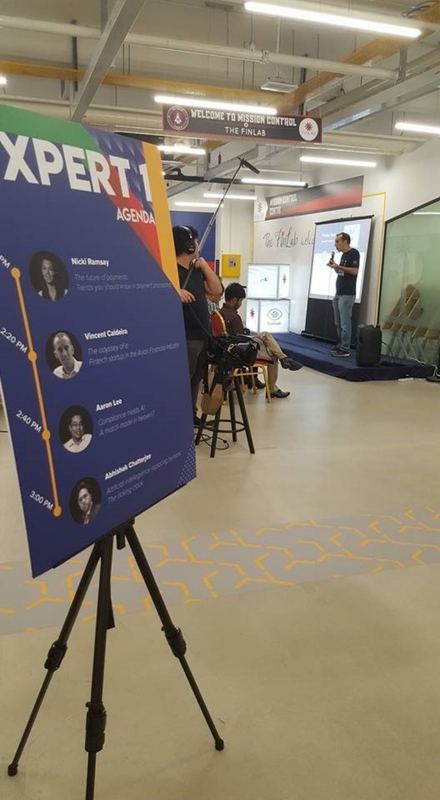 The Pitching Day in Singapore was held on 11th Jan 2018 at the artistic co-working space at The Working Capitol on Robinson. Ten startups pitched their innovative solutions to the five judges for that one ticket to the Grand Finale held in Tokyo. The results? Bondlinc won the ZAMMA AWARD, named after Mr Kotaro Zamma himself! We would like to thank everyone who made this event and experience possible! Shortly after our Echelon experience, BondLinc is back for more FinTech fairs! BondLinc will be going to Kuala Lumpur from the 5th to the 6th of July. We will be participating in the event Building Global FinTech Connections: Singapore with Kuala Lumpur organised by the Monetary Authority of Singapore (MAS). This is a great opportunity for us to meet other FinTech startups and parties interested in FinTech developments. We are always on the lookout for potential partners that would work with us and help us extend our reach in the region. We will be manning our booth in the event as one of the finalists of The Finlab (Cycle 2). Do look out for our booth located in the UOB cluster and drop by if available!